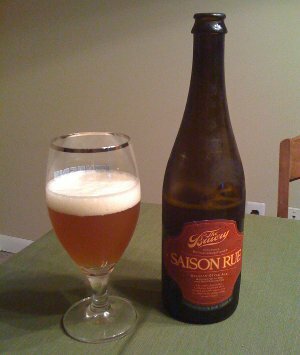 The Bruery Saison Rue - I've only had a few beers from The Bruery before, but they've been uniformly excellent. Pours a cloudy yellowish orange color with an ample white head. Smells of Belgian yeast, some sweet candi, and... is that brett? (Yes, it's apparently brettanomyces. I was not aware of this when I opened it, but it's printed right there on the bottle.) Taste is sweet with a little spice. The slightly tart brett flavor comes out in the finish. It has a kick to it, but not in an overpowering or particularly sour way. Bigger body than I was expecting, but still appropriate for the style . I had no idea this was a Brett beer when I opened the bottle, but it works very well. It's definitely something I'd like to try again sometime, as I hear it has different characteristics when it's fresh. B+ but maybe slightly better than The Bruery's Saison de Lente, which is similar in style (In fact, it's almost too similar - I'd love to see The Bruery's take on a more Dupont-style saison, but C'est la vie). Beer Nerd Details: 8.5% ABV bottled (750 ml capped). Drank out of a goblet on 6/17/11. Beer Nerd Details: 5.5% ABV on tap. Drank out of a tulip glass on 6/17/11. I've had one other De Ranke beer, called Guldenberg, which seems like it could be a really great beer. I say "seems like" because I've had two bottles of the stuff, and both were so super-carbonated that the cap practically popped off the beer along with a jet of foaminess, leading to a beer that ultimately tasted a bit on the flat side. Ultimately, I'd like to find a non-exploding bottle of that to try again, but I don't think I'll be trying their saison again. As for the Bruery, this is not my favorite of their beers, but it's damn good and I will continue to seek out their beers, wherever I can find them! 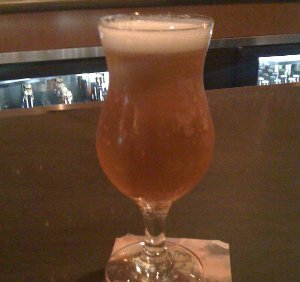 1 - Actually, looking at my archives, it seems like saisons are a staple of my beer diet, no matter what time of the year. Given that a saison was my real entrance into the world of great beer, I guess that makes sense. 2 - Believe it or not, "funk" is actually an almost technical term for this kind of taste. It's one of the words typically used to describe beers brewed with Brettanomyces, a wild yeast strain often used in sour beers (though I guess it doesn't always equate with sourness, it often accompanies it). 3 - I suppose my two broad categories could be considered too broad. There does seem to be a more historically relevant version of the style which is actually very low ABV, while more modern takes on the style tend to be in the 5-9% range. It's probably possible to break the style down further, or to just say "screw it" and proclaim the style styleless, but I kinda have that instinct for most Belgian beer styles, which all tend to be rather broad ("Belgian Strong Dark" can be used to describe a huge variety of beer). This page contains a single entry by Mark published on July 21, 2011 8:36 PM. Dogfish Head Indian Brown Ale was the previous entry in this blog. Belgian Independence Day is the next entry in this blog.